Studies show that keeping one’s mind active, especially by learning new things, can help stave off dementia, or the progression of it. One such study was done in 2009, and even though that was seven years ago, the bottom line results remain true today. 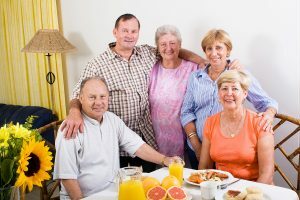 It was a study done by the American Association of Neurology, and it showed that seniors who regularly took part in activities like reading or other things that involved learning and stimulating the mind, had a 30 to 50 percent less chance of developing memory loss issues, as opposed to those who didn’t participate in such activities. That is huge! And such an easy, even fun, way to help prevent memory loss issues. Seniors learn in many different ways and there is no shortage of opportunities in which they can benefit from—either online or in person. And it’s something you or their senior care provider can do with them. But your loved one doesn’t have to enroll in college, or seek out a full-blown degree to get the benefits of ongoing learning. And you or the agency providing senior care for them can help them in their quest for additional knowledge. First off, help them seek out classes at their local senior center of YMCA. It might be a First Aid class, or a class that teaches knitting, creative writing, photography, calligraphy, painting, etc. There also may be local churches, community groups, department of recreation, or other organizations that offer classes on a variety of topics. Some may be free or discounted for seniors and their caregivers. There are also local groups that offer social activities that perhaps you or your loved one’s senior caregiver would like to participate in with them. They’re called Meet Up groups and they offer different activities for beginners and learners, as well as more experienced persons. The activities are also broken down in some cases by age groups. Activities range from the most active of things to the most laid back, such as cooking, playing cards or other board games. There’s no charge to join a Meet Up group, though there may be a charge for certain activities. There may also be classes at the local university, community college or technical college that your family member is interested in. Most schools these days offer at least some classes online, so if getting out to a class is a problem, they can still enroll and take advantage of the learning experience. Rarely are they offered free, however. Finally, there are MOOC classes (Massive Open Online Course). A person can enroll in one or more free online courses on practically anything they can think of. The courses usually run six to eight weeks; students who successfully complete the course can download a certificate of completion, if they wish. These courses are a fantastic way to experience different instructors and professors from institutions all around the world and gain additional knowledge—and again, for free. If you or an aging loved one are considering senior care in Old Bridge Township, NJ, please contact the caring staff at Lares Home Care 1-800-781-7435 or 732-566-1112.